Lionesses are very protective of their young cubs. Lions are not only in danger from trophy hunters, but also from lions of other prides. 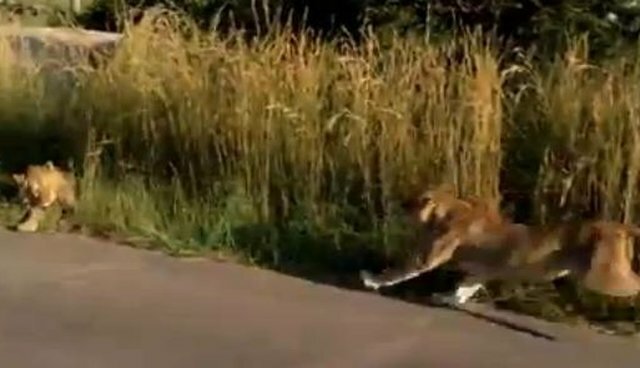 A bus of tourists recently saw a mama lion with her cub encounter a male lion in their path - and what happened next shows just how much lionesses care for their cubs. The intimidating male lion was hanging out on the side of the road, watching something further down the way. It turns out, the male lion had spotted a mother lion and her cub, coming down the road toward him. As soon as the lioness spotted the lion, she knew her child might be in danger. She left her cub behind and charged at him, attacking him in order to keep him away from her cub. The lioness was so fierce that the male lion retreated, leaving her and her cub alone. Talk about protective instincts. This mama lion likely saved her cub's life - and acted as any mother would to make sure her baby stayed safe. Videos like this reinforce our belief in the amazing capacity that lions have to love .